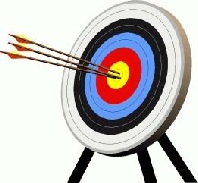 Lutterworth Archery Club is an Archery GB “On Target Community Club” and has a membership ranging in age from 9 to 70+. We accommodate all bow types (No Crossbows though) and offer club competitions for those who wish to participate and officially record their scores. The main emphasis at Lutterworth Archery Club is enjoyment, in a friendly environment where everyone is welcome. (Guests are welcome on club days subject to target availability. “Have-a-Go” & Corporate Sessions can be arranged. In the outdoor season (April to October) we shoot at our own field located between Walcote and North Kilworth. Club days are Saturdays (14:00) and Wednesdays (17:00 ). Senior members are able to shoot on any day, at any time during daylight hours. In the indoor season (October to March) we now shoot at Lutterworth Leisure Centre on Saturdays afternoons (14:00). Membership fees: can be paid either yearly by cash/cheque or monthly by Direct Debit. There are no additional shooting fees outdoors and just a small fee for shooting indoors to cover hall hire. We have coaching and bow tuning sessions with a qualified coach as required. Our aim is to enable and facilitate members to enjoy archery, whether they are competitive or not. We encourage and help members to improve, of course, since this can give a feeling of achievement but beating someone else or winning is not what it’s all about. We have members who are very competitive, some in the county team and others who just love to shoot.